Panasonic TX-L32E30B review | What Hi-Fi? 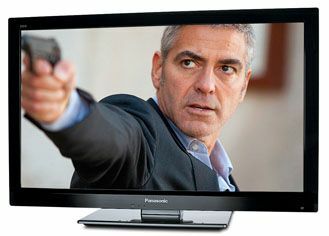 We took our first look at a 2011 Panasonic TV in May 2011. It was a premium (£1200) 37in set, and performed superbly. But if bells and whistles aren’t what you’re after, Panasonic suggests you look at its E30 range, such as this 32in edge-LED LCD – yours for around half the price. But make no mistake: this ‘stripped-down’ TX-L32E30B still packs plenty of features. It has a Freeview HD tuner; the Viera Connect internet TV service; USB recording to an external HDD; four HDMI and three USB connections; a digital audio output and SD card input… The only box that isn’t ticked is 3D. The Viera Connect service itself is good. BBC iPlayer, Acetrax movies, Facebook, YouTube, Skype, Twitter are all present and correct. The basic layout is clear, too; the TV’s interface is similarly simple and there’s a sensible rather than daunting amount of tweakable picture-processing options. We dabbled with the Intelligent Frame Creation, which we think introduces a little instability, but Clear Cinema works better. Motion isn’t perfect watching the Blu-ray of Gulliver’s Travels – in comparison with the best, certainly – but it’s good enough not to be distracting in isolation. The natural colour palette is poised, offering punch and subtlety, while insight is excellent and edges are sharp. Black levels are dark and true but do lack detail at times. Switch to Freeview HD and you get a bright, punchy picture that’s largely free of noise and again sporting plenty of detail, with only wide-angle, expansive shots lacking sharpness. Standard-definition channels need reigning in at times thanks to their bright colours, but this is a decent TV tuner. It’s a shame that the sound is no great shakes, getting screechy at high volume. This television’s strengths lie with its price-tag, the excellent video performance and thorough internet TV offering. If that matches your wish-list, it could be for you.